Teapot Set by Iwachu, 20 oz. 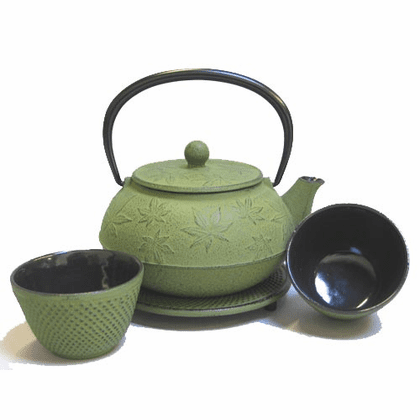 Lovely handcrafted raised green maple leaves adorn the body of the teapot. Has a stainless steel infuser basket, and baked porcelain enamel inside. Holds 20 ounces, 5-1/4" in diameter. This teapot comes with a matching color cast iron trivet in the hobnail, which is 5-1/2" in diameter. This set also comes with two matching color cast iron tea cups in the hobnail design that are 3" in diameter. Each tea cup holds 4 ounces. Manufactured by Iwachu in the Iwate region of Japan.